5 year anniversary party - the details! We are working away like crazy at the studio trying to get everything ready for our upcoming HUGE studio party! To say we're excited about this would be an understatement! You have heard about this, right? Mango Reclaimed is having a 5 year anniversary party this Saturday - and YOU'RE INVITED!!! Let me give you a little run down, on the low down, about what's going down . . .
Just for showing up you will get a super cute Mango Reclaimed reusable tote bag! Just for showing up you will get 5 raffle tickets that you can enter into any of our 5 awesome raffle prizes! (We're talking 5 amazing paint kits with full sized paints, brushes, wax finishes . . .) Courtesy of our amazing suppliers Miss Mustard Seed's Milk Paint, Fusion Mineral Paint, van Gogh Fossil paint & ClingOn brushes! Ummm Yah! They're that good! We will have incredibly delicious treats for you from Eat My Shortbread! Just because we love them - and you! Feel like shopping on Saturday?!? This is the deal of the century! Because it's our 5 year anniversary - every 5th item you buy is FREE! * That's right my friends! Time to stock up on some DIY supplies!! This is unheard of! Let me break this down: if you buy 5 pints of Fusion Mineral Paint, one of them will be free! If you buy 5 quarts of van Gogh Fossil paint, one of them will be free! 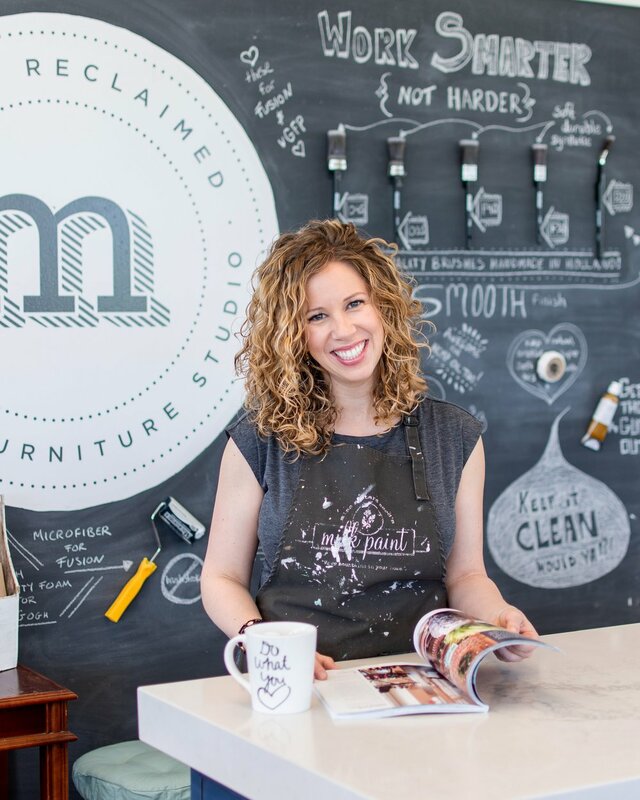 If you buy 4 chairs and a bag of Miss Mustard Seed's Milk Paint, one of those will be free! If you buy 2 paints, 2 waxes and a sweet new brush, one of those items will be free! I think you're getting the idea, lol! Sweet. Amazing. Deal! Is this post long enough yet, lol!?! Sorry - almost done! Did I mention that we are also GIVING AWAY a blanket ladder . . . AND a $100 workshop gift certificate! What?!? That's right!! Build Like A Girl Canada will be joining us for the day to showcase all of the amazing workshops we have coming up in our 'new' workshop space (which is actually our former showroom - you're definitely gonna want to check it out!) Especially cause you'll get a chance to win a beautiful blanket ladder & a $100 workshop gift certificate! So you see my darling - when we throw a studio party - we don't mess around! Trust me - you are not going to want to miss this!